Ahmad Shah DURRANI unified the Pashtun tribes and founded Afghanistan in 1747. The country served as a buffer between the British and Russian empires until it won independence from notional British control in 1919. A brief experiment in democracy ended in a 1973 coup and a 1978 Communist counter-coup. The Soviet Union invaded in 1979 to support the tottering Afghan Communist regime, touching off a long and destructive war. The USSR withdrew in 1989 under relentless pressure by internationally supported anti-Communist mujahedin rebels. 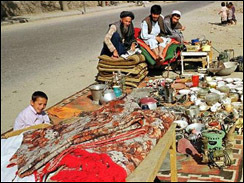 A series of subsequent civil wars saw Kabul finally fall in 1996 to the Taliban, a hardline Pakistani-sponsored movement that emerged in 1994 to end the country's civil war and anarchy. Following the 11 September 2001 terrorist attacks in New York City, a US, Allied, and anti-Taliban Northern Alliance military action toppled the Taliban for sheltering Osama BIN LADIN. The UN-sponsored Bonn Conference in 2001 established a process for political reconstruction that included the adoption of a new constitution, a presidential election in 2004, and National Assembly elections in 2005. In December 2004, Hamid KARZAI became the first democratically elected president of Afghanistan and the National Assembly was inaugurated the following December. Despite gains toward building a stable central government, a resurgent Taliban and continuing provincial instability - particularly in the south and the east - remain serious challenges for the Afghan Government. Afghanistan's economy is recovering from decades of conflict. The economy has improved significantly since the fall of the Taliban regime in 2001 largely because of the infusion of international assistance, the recovery of the agricultural sector, and service sector growth. Real GDP growth exceeded 7% in 2008. Despite the progress of the past few years, Afghanistan is extremely poor, landlocked, and highly dependent on foreign aid, agriculture, and trade with neighboring countries. Much of the population continues to suffer from shortages of housing, clean water, electricity, medical care, and jobs. Criminality, insecurity, and the Afghan Government's inability to extend rule of law to all parts of the country pose challenges to future economic growth. 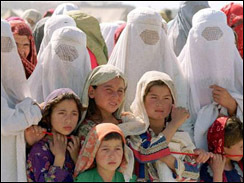 It will probably take the remainder of the decade and continuing donor aid and attention to significantly raise Afghanistan's living standards from its current level, among the lowest in the world. International pledges made by more than 60 countries and international financial institutions at the Berlin Donors Conference for Afghan reconstruction in March 2004 reached $8.9 billion for 2004-09. While the international community remains committed to Afghanistan's development, pledging over $57 billion at three donors' conferences since 2002, Kabul will need to overcome a number of challenges. Expanding poppy cultivation and a growing opium trade generate roughly $3 billion in illicit economic activity and looms as one of Kabul's most serious policy concerns. Other long-term challenges include: budget sustainability, job creation, corruption, government capacity, and rebuilding war torn infrastructure. Gunmen attacked a guest house used by U.N. staff in the Afghan capital of Kabul. The powerful car bomb exploded outside the Indian Embassy in the busy center of Afghanistan's capital.